Product code: 1200 (Wt. range 201g). Admiral Jellicoe Going Up to The Bridge of His Flagship. The Flagship of Admiral Jellicoe Full Speed Awash. A View of the Flagship Deck in Rough Weather. Part of the north Sea Battle Fleet in Line. Part of the Falkland Islands the Nearest Land to the Scene of the Naval Victory in the South Atlantic. Admiral Von Spee's Squadron in The Harbour at Valparaiso Prior to the Ill-fated Voyage. Admiral von Spee Embarks from Valparaiso. British Lancers Going Into Action. The London Scottish After a Night Attack on the Enemy. 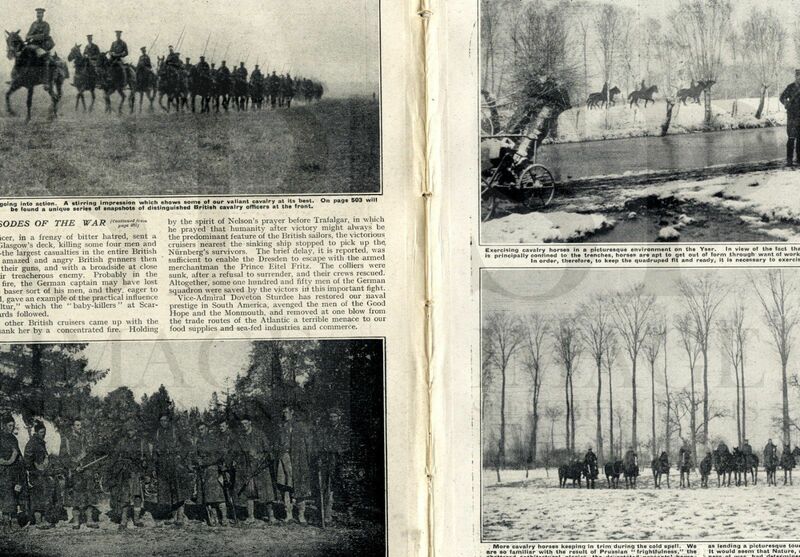 Exercising Cavalry Horses in the Snow on the Yser. Horses Being Exercised in the Snow. General View of Przemysl the Galician Stronghold. Field Marshal von Kusmanek Commander of the Austro-Hungarian Garrison. Battery of Austrian Artillery on the Outskirts of Przemysl. Russian Soldiers at the Railway Station at Lemberg enroute for Przemysl. Info. Lviv Ukraine. Russian Wounded Soldiers Returning From the The Front by Train. Galicia - Russian Battery Working under the Direction of A Gunner Locating the Enemy Position From up a Ladder. Austrian Prisoners and Russian Captures "Settle the Affair" by Means of a Friendly Wrestling Match. Alleged "Irreconcilable Enemies" Fraternising near Lemberg: Austrian Prisoners Taking a Meal With Russians. Helmieh, Egypt - New Zealand Troops Setting Up Reive Their Immense Stores in a Village. Australian Troops Relaxing in front of the Pyramids. Troops on Camels in Front of the Sphinx. Scenes at the "Buffet" of the New Zealand Contingent. British Sea Planes Typical of Those Used in the Raid. Flight Lieutenant A. J. Miley RN - An Airman Who Took Part in the Raid. Flight Sub Lieutenant V. G. Blackburn RN An Airman Who Took Part in the Raid. Flight Commander R. P. Ross RN. Flight Commander D. A. Olvier RN. Flight Commander C. F. Kilner RN. Flight Commander C. H. K. Edmonds RN. The Raid on Fortified Cuxhaven - double page from a drawing by C. M. Sheldon, with article, showing a scene as might have been witnessed from the foredeck of the Undaunted, when its guns and those of HMS Arethusa, being loaded by sailors, being fired at the Zeppelins. Also shows planes in the air. Info. - info. Artist Charles Mills Sheldon b. Lawrenceburg, Indiana, 1866 - d. Chiswick, London 1928. He was an American journalist and illustrator who reported on many wars, including the Boer War and the First World War. The British Navy Hoisting a Hydroplane from a Pinnace into Position Next to a Ship. How the Seaplane Appeared Over Cuxhaven. British Naval Hydroplane at Weymouth. 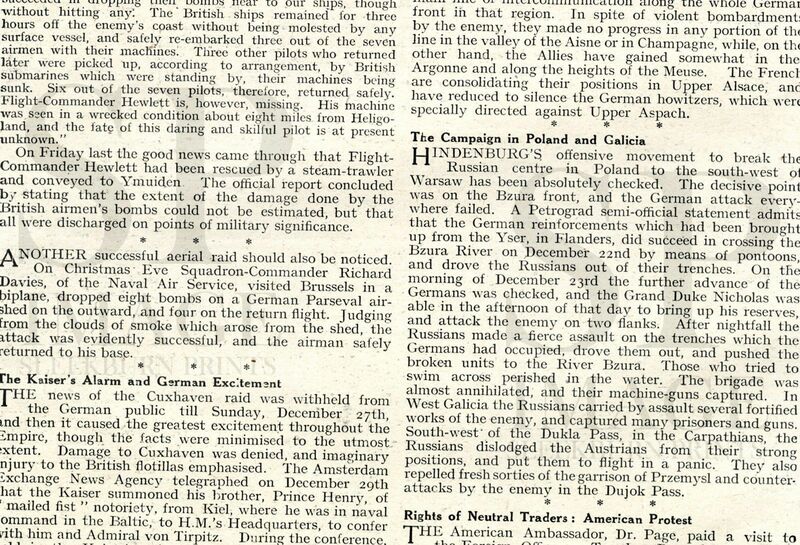 Somewhere on the Continent - Soldiers Trying to Follow an Air Fight Between A British Plane and a German Taube. Flight Commander Grahame-White Chatting with a British Soldier and French Airman in France - info Claude Grahame-White Hendon. Sub Lieutenant Travers in Flight on a Borel Waterplane Over a Troopship off Netley Hants. Major Seligman Attached to J. Battery RHA and Member of Headquarters' Staff. Brigadier General Gough Who Succeeded in Clearing the Enemy fromthe Bethune Aire Canal Region. Military Attaches Inspecting German Trenches near Antwerp. German Soldiers in a German Bomb Proof Shelter. German Soldiers Dining in a Trench. East Prussian Battlefield - German Soldiers Asleep in a Trench While Their Comrades Keep Watch in the Snow. Austrian Infantry Look-outs in Snow Covered Trenches in East Prussia. sleekburnc. Galicia - Austrian Officers Directing Fire of a Battery by Field Telephone From an Observation Post. Verdun - A German Officer in a Dug Out and on the Telephone to His Headquarters. A German Outpost Patrol Taking a Message on a Telephone. British Soldiers at Boulogne Listening to Entertainment (Arranged by Mister Seymour Hicks, Miss Ellaline Terriss and Miss Gladys Cooper) - shows inside a building with the wounded soldiers lying at the front of the hall; two photographs. Three Members of the RSPCA with the Army Veterinary Corps Attending a Wounded Horse. HQ of the Blue Cross Society at Serqueux - A Horse Being Treated. Serqueux Veterinary hospital: A Horse Being Attended. Members of the Army Veterinary Corps Preparing a Prescription on a Fire Behind the Fighting Line. Paris: Women at the Abbaye de Theleme, Montmartre Hard at Work Making Bandages. Daughter of Kaiser Wilhelm, the Duchess of Brunswick, Feeding the Children of German Reservists. Tokyo Japan: Geisha Girls of the Yanagibashi Quarter Preparing Consolation Bags for Japans Fighting Men. Belgian By Birth Austrian By Marriage - Countess Lonyay the Leader of the Red Cross in Vienna. The Agency of Mrs Alec Tweedie, 12 Russell Square, London WC: Women Sorting Books, Games Etc. The Tsaritza and Her Two Daughters Princesses Olga and Tatiana Assisting in the Care Miel of Wounded Soldiers at Petrograd. Drummer Spenser J. Bent Who Has Received the VC - Rescuing Private McNulty and Dragging Him to Safety with His Feet - full page from a drawing. Major H. B. W. Smith-Rewse - Royal Field Artillery. Captain T. P. Dorington - 1st Royal Dragoons. Captain Everard J. Lamb - 1st Battalion Northumberland Fusiliers. Capt. H. Whitaker - Rifle Brigade. c.keenlyside. Captain C. B. Chichester - The Buffs East Kent Regiment. Captain C. Symes-Thompson - Grenadier Guards. Captain Miles Radcliffe - Border Regiment. Lieutenant S. K. R. Gore - Royal West Kent. Lieutenant K. P. Henstock - Middlesex Regiment. Lieutenant Sidney A. Goldsmid - Worcester Regiment. Lt. H. W. Nicholson - Cheshire Regiment. Lieutenant J. M. Atkin - Sherwood Foresters. Second Lieut. H. P. Hartnoll - Worcester Regiment. Sec. Lieutenant P. McDonagh - Royal West Kents. Second Lieutenant R. W. Fletcher - Royal Field Artillery. Lieutenant A. P. F. Lyon - Gordon Highlanders. 2nd Lt M. A. Hepburn - Seaforth Highlanders. Second Lieutenant J. H. G. Lee-Steere - Grenadier Guards. The Battle off The Falklands Islands in the South Atlantic. The Raid on Cuxhaven - two articles, with mention of Douglas A. Oliver - Francis E. T. Hewlett - Robert P. Ross - Cecil F. Kilner - Arnold J. Miley - Charles H. K. Edmonds - Vivian Gaskell Blackburn etc. German Raid on Dunkirk - approx . 130 words. The Western Battle Front with mention of The Yser - Flanders - Vosges - Meuse - Alsace. The War in Poland and Galicia. It measures 285mmx220mm (11.25 x 8.5") approx. There are binding witness marks to the outer spine. There is age yellowing/toning and some marking. Some creases etc to corners and handling marks to edges. images, photos sketches etc. vary in size. PLEASE NOTE: I cannot guarantee that the issue is complete 'as published' - but what I have described above IS present. The outer cover is missing; but as far as I can tell there are no other pages missing. If you're looking for something in particular in this issue PLEASE ASK. If you require information on size of articles (i.e. number of words), sizes of images, please ask before bidding or buying. This item will be packaged in a board backed envelope. Product Code 1200 (Wt. range 201g).